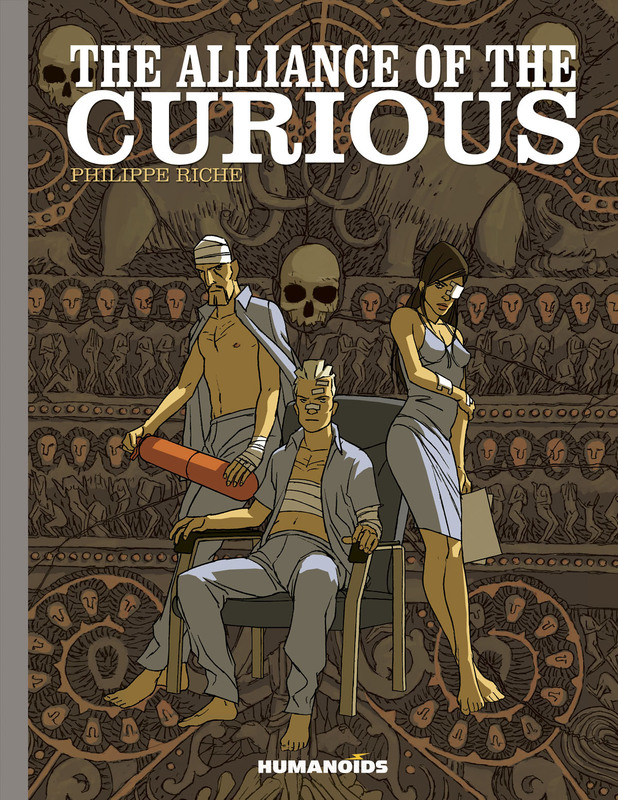 A unique tale of action, black comedy and mystery, Humanoids brings English speaking audiences Philippe Riche’s The Alliance Of The Curious. A completely interesting story about crazed blondes, scavengers and antique dealers, neanderthals and regal blood lines, this one is a page turner. 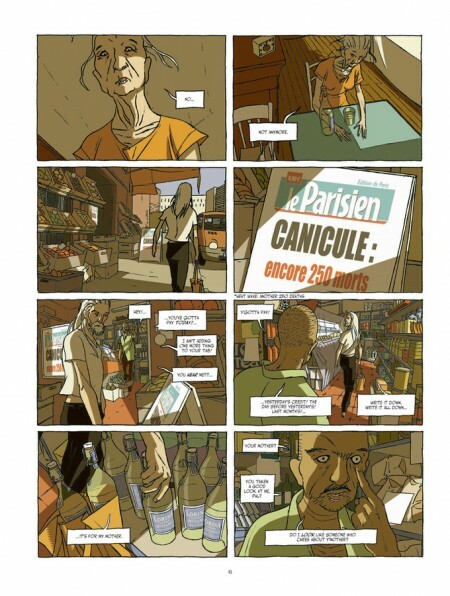 First published in French as two volumes in 2006 and 2008, Humanoids gives us one complete deluxe hardcover written and illustrated by Philippe Riche. Like all good mysteries we’re presented with various story threads that eventually weave themselves together into a cohesive whole. A mother dies in a heat wave while her elderly son is arrested for shoplifting, leaving him homeless and destitute. Three blonde identical triplets work high society in a bid to land the king of France. A junk dealer purchases the contents of an apartment, only to discover an ossuary. Each leads to confrontations, discoveries, and a lot of action. 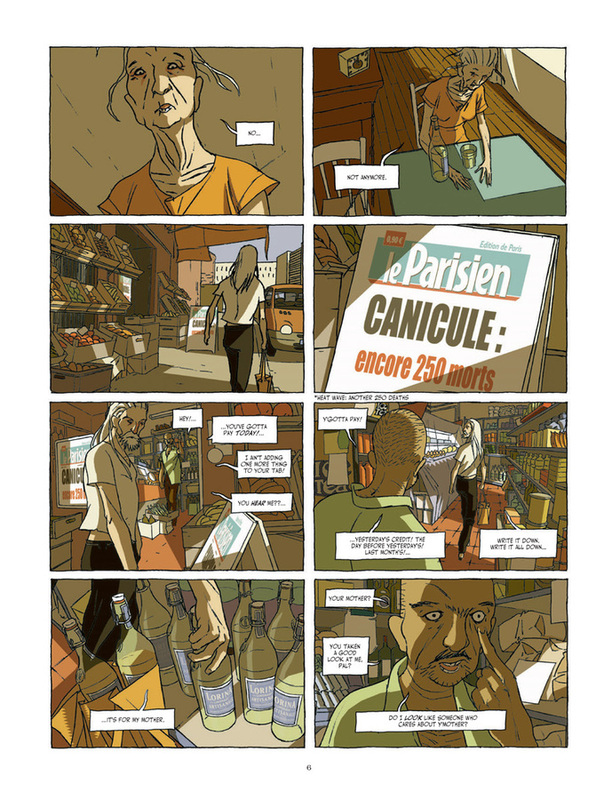 What’s driving everyone on this path is our white-haired friend who starts to get flashes of memory from other’s lives, slowly revealing his unique part in human history, French royalty and a promise from the dawn of time. Left behind in his apartment is a golden ossuary containing a Neanderthal skull, purchased by a junk dealer along with the apartment’s contents. The current heir to the royal throne and its extensive finances sends his triplet girlfriends to eliminate this new-found competition and brings the junk dealers into the fray. They turn to an antiques dealer for information on the skull and as more is learned form the alliance of the curious. There has to be winners and losers in every tale but the ending is definitely out of the norm. It works as a whole, but don’t try to break the sum into its parts. 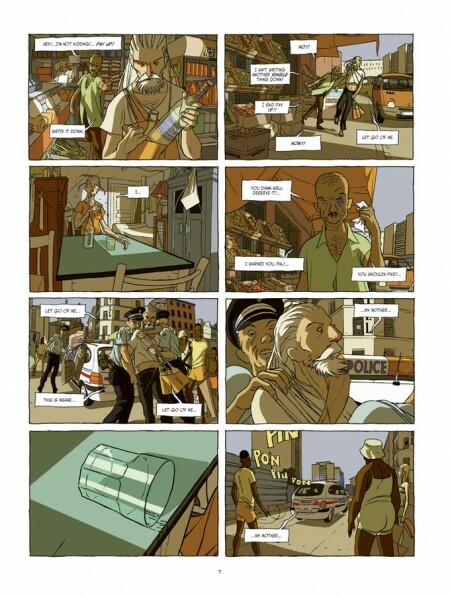 Riche provides information along the way as it’s required to explain the current situation, and he makes it work by weaving throughout this violent story elements of humour characteristic of society today: sarcasm and absurdity. Whether it’s snappy one liners from trigger-happy supermodel types or cooking tips from the one guy who never gets to eat a meal, our cast is completely unbelievable. And that seems to be just the way Riche intended. Let’s back up a minute and provide some insight and spoilers. This alliance of antique dealers is proposed by the one actual antique dealer in the group, for no apparent reason, to a junk dealer and his girlfriend who so far haven’t brought anything to the party. He offers to foot the bill and bring his network of information and experience while the others will bring a short skirt and whingeing cooking tips. Hmm. Our triplet hit squad starts off trying to screw their way into royalty and immediately becomes gun-toting experts with connections at all levels of government. A Neanderthal family has existed as the last of its kind for centuries by constantly marrying distant cousins yet never moving that unique gene pool one smidgen. See, I gave it too much thought. The art style here is unique in its detail and disconnected line work. Clean and uniform lines with a great amount of detail and wonderful use of colour. No shading but shadows throughout. Each character full of expression and definition: just look at that cop’s face! At times the art looks to have been blown up too large, lines not meeting on images and breaking apart. It appears Riche works digitally and it would be interesting to know it that was his intention. 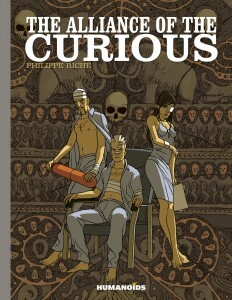 The Alliance Of The Curious is a solid hardcover in that wonderful slightly oversize Humanoids format. As usual there are no extras, even though a short biography would have been appreciated for North American audiences not familiar with Philippe Riche. At $30 it’s a solid read and has the wherewithal for multiple reads. Originally published at Comic Book Daily.